Do you have questions about what to look for in new running shoes? Well try to keep it simple! 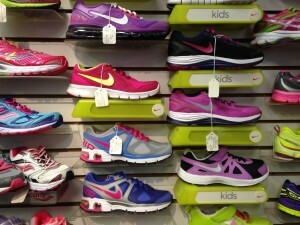 Here are a few ideas and things to think about when picking out your next running shoe. Make sure your toes and forefoot have enough room. When you run your foot spreads and swells slightly so you want to have room for that to happen. It might even be good idea to try on shoes after running when your foot might be the biggest for this very reason. Fit the shoe to your longest toe so you won’t be at risk for rubbing or blisters. If you have a bunion make sure there are no seams or irritating areas over that area. Check the inside of the shoe with your hand to be sure. The heel is one area that should be snug. Your heel should not move up, down or side to side when running. If it does, you will be prone to blisters. If you wear orthotics, make sure they will fit comfortably in the shoe. The shoe should bend easily behind the ball of the foot. This is necessary for pushing yourself forward. If it is too stiff here, you will be wasting energy bending your shoe instead of getting to the finish line. If you are a trail runner, you might need more rigid sole for protection from the elements otherwise don’t worry too much about the bottom of the shoe. But most importantly try on several pair and run in them. Most running shoe stores have a treadmill for the very reason. In summary, your body will really do the picking.We all come in slightly different shapes and sizes and you should always pick the shoe that FEELS the best.Most likely the one that feels the best in the store will feel the best on your run.And above all don’t buy a shoe for color, style, price or because it’s the latest fad.Buy a shoe that feels like your favorite pair of jeans.It should be comfortable, supportive and did I mention comfortable!